University of Leicester ranked 16th in The Complete University Guide – but what does that mean? Being a prospective student, you have probably searched all the university ranking tables to see which position universities are in. While this is a good idea, personally I would not take ranking tables too seriously. In this blog entry, I will tell you how to approach these tables and some good tips for deciding if University of Leicester is right for you. University of Leicester is ranked 16th in The Complete University Guide which was published a couple of days ago. This is great news since the University moved up four places from where it was last year. This shows that the University is consistently improving across the board – especially when it comes to finding the bones of Richard III in a car park. I mean who isn’t impressed by that? However, one thing the tables do not necessarily tell you is how good a subject is at the university. You could go to the best university in the UK but find out the subject they are offering at that institution is ranked the worst. This is why you cannot solely rely on the positioning of a university. The Complete University Guide also has subject ranking to determine how good a particular subject is taught at an institution. 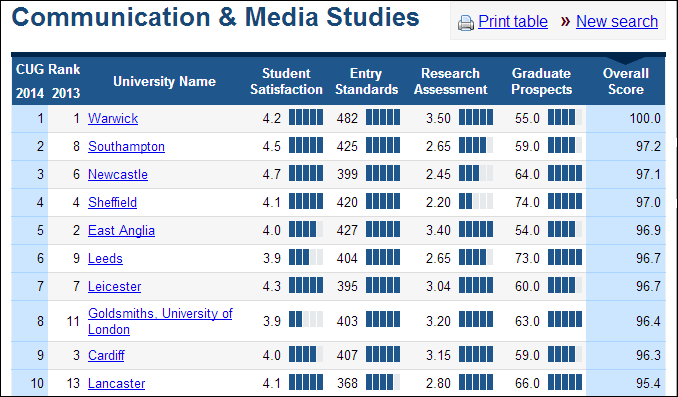 As we can see from the 2014 subject ranking table from The Complete University Guide, University of Leicester is placed seventh for Media and Communications. While this is great and higher than the overall ranking – this shows no change from the ranking in 2013. Warwick is rated the best with a perfect overall score of 100, but would you enjoy the modules taught at Warwick? And is Warwick a great city that you would want to spend three years of your life at? Obviously since I am at Leicester Uni and doing the course, I would highly recommend it, but I advise you to look more closely than what the figures say and make an informed decision. If you want to do more research on university guides, then check out these links below! More tables will be published in the coming weeks for 2014 rankings.